Remote controlled vehicles are moving from toy store shelves into full-scale trucks for the freight and logistics industry. Swedish transport company Einride is developing the T-pod, a full-scale heavy-duty truck that can be operated remotely by a driver sitting miles away in an office. It doesn’t even have a driver’s cabin or manual controls. This fall, a human will “teleoperate” the T-pod between two DB Schenker logistics facilities in the Swedish city of Jonkoping as part of a commercial pilot program that could be expanded globally. Last month, Enride unveiled its T-log, an autonomous, all-electric logging truck. 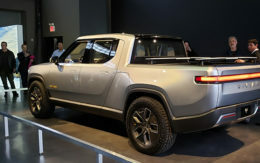 More powerful than the T-pod — the all-electric, autonomous truck Einride revealed last year — the T-log incorporates some off-road capabilities and is designed to navigate forest roads. It hopes to start testing the T-log to public roads by 2020. A human is still driving the T-pod, just doing it from a distance. A triple novelty, the T-pod is a battery-electric cargo truck that can drive itself in most situations or be “teleoperated.” Using a 4G cellular network, a remote driver accesses the truck’s cameras and other driving systems to not only navigate from afar in real time but navigate as many as seven vehicles at once. The basic idea of teleoperation is that “autonomous vehicle technology has advanced to a pretty good state,” said Elliot Katz, co-founder and chief strategy officer of Phantom Auto in Mountain View, Calif., which is providing the teleoperation system for Einride. Autonomous vehicles are 97 percent of the way to being able to do everything a human can do, “but that last three percent is a very, very difficult piece of the puzzle. It could be decades away,” Katz said. Phantom Auto will teleoperate the T-pod at a so-called control center, which consists of multiple computer screens showing what the vehicle’s cameras are seeing. Similar to a video game setup, the teleoperator sits in front of the screens and drives using a steering wheel, brake and accelerator pedals and controls for things like turn signals — “everything you would need in a car if you were inside a vehicle,” Katz said. Lacking a driver’s cab “makes the T-pod comparatively cheap to produce. It also gives it a much greater cargo capacity. The main benefit, however, is flexibility and cost effectiveness,” said Einride’s Falck. “The ultimate goal is to force a transition to a sustainable transportation system,” Falck said, adding that T-pods could potentially be used for up to 60 percent of all goods transport in Sweden. “Most people believe that, especially early on as autonomy is developing, that there’s going to have to be some kind of human remote connection, and that’s a newer thought process in the last year or two,” said Michael Ramsey, a transportation analyst with Gartner Inc.
“People have come around to the idea that there’s too many complexities, and if we wait for a computer to solve them, it will be 20 years before we launch these things,” Ramsey said. Using remotely controlled vehicles for logging and mining operations makes sense because the industries are remote and dangerous but also have controlled environments, he said. Vehicles typically travel back and forth over the same route. Attracting drivers to such areas is difficult— and expensive. Removing the two most expensive parts of a truck — the cab and the driver — creates the economic efficiency to make remotely controlled vehicles attractive to business, he said.